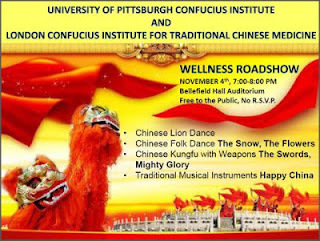 PennsylvAsia: Traditional Chinese dance, martial arts at "Wellness Roadshow", November 4th. Traditional Chinese dance, martial arts at "Wellness Roadshow", November 4th. The performance includes Chinese Lion Dance, Chinese Folk Dance, Chinese Martial Arts and various Chinese traditional instruments. It will be a great interactive opportunity to experience Chinese dance and kungfu as well as a wonderful cultural immersion experience! Remember, too, on November 11th the Golden Dragon Acrobats will be performing at that same Bellefield Hall.